I have been a Lacto Vegetarian all my life and now slowly trying transitioning into being Vegan. This is going to be very very difficult for me as I love my masala chai , paneer dishes and all the ghee laden Indian sweets like mysore pak to its core. So to give myself a boost I have joined 21 Days Vegan Kickstart India challenge and hope I can stick to it. Most of our Indian gravies and curries are vegan, that is if we don't add ladles and ladles of cream or ghee tadka to make it rich. 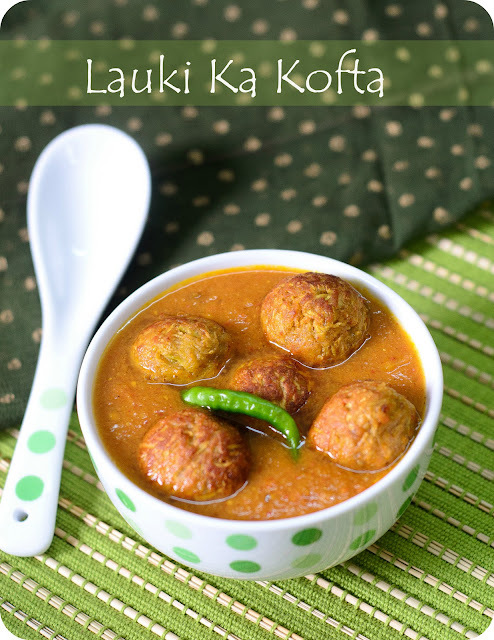 One such gravy dish which is my favourite is Lauki Ka Kofta. I love those kofta balls floating in delicious gravy. I have made the kofta balls in non stick aebleskiver pan ( appam pan) with very less oil and have not added any cream in the gravy, thus it's completely vegan. Add salt in the grated bottle gourd and keep aside for few minutes, then squeeze out the water. Mix with it chick pea flour, red chilli powder, dry mango powder and make a dough out of it. Make 12 equal balls of the dough. In the appam pan put few drops of oil in each section and then put the kofta balls for shallow frying. Keep the pan covered and once the bottom side turns light brown turn it over and cook covered the other side as well. Take out the kofta balls from the pan and keep aside. For the gravy grind onions, ginger, garlic and red chillies together. Heat oil in a deep pan and once hot add in the onion paste and fry till raw smell disappears. Add in the tomato paste along with turmeric powder, coriander powder, green chilly, salt and red chilly powder. Fry till the mixture starts leaving oil from the side. Add in 2-3 cups of water and bring to boil. Now keep the gravy in simmer for another 5 minutes. Add in garam masala and switch off the gas. Before serving add the kofta balls in the gravy and heat it for another minute or so. Serve hot with rotis or parathas. this is my second recipe i've seen today with bottled gourd! this looks awesome! i love the spices, flavors, here! :) sending some #squashlove to you! I love Indian cuisine, and among my favorite vegan and vegetarian dishes are Indian food! So happy to discover your blog via Squash Love! Thank you for sharing! I have to say that this is perhaps the most tasty squash recipe I have seen in a while. I really want to make it. Kofte in Yumm and Creamy Sauce Dear.Luv the recipe and the use of Paniyaram Mould for frying Kofte. this looks so warm and inviting! Lovely! Especially the image with koftas is gorgeous. Raji that surely is a great challenge to become a vegan and the koftas look perfect. Wow! The koftas are very delicious and tempting! wow awesome way tomake perfect koftas....love it! i love learning new things about cooking and this dish is one of them! thanks for sharing your recipe and goodluck on your goal to being a vegan! nice meeting you at #squashlove! looking forward for more! Kofta curry looks very inviting. Love the way you have prepared. Healthy n tasty. thats awesome. never tried this recipe but love this dish. looks wonderful. Nice Kofta curry !! looks very inviting !! Its absolutely fabulous that you are trying a vegan diet!! it sounds difficult in the beginning, but u are not giving up anything, just substituting slightly different things. i dont miss paneer, cream, ghee at all! the replacements feel so much better on the stomach. The koftas in the appam pan is such a fab idea! Ping me anytime for any questions! Have an amazing day! and i am truly happy about you trying the kickstart! Absolutely gorgeous and so healthy! I have issues with cooking such dishes in the Unniappam pan. 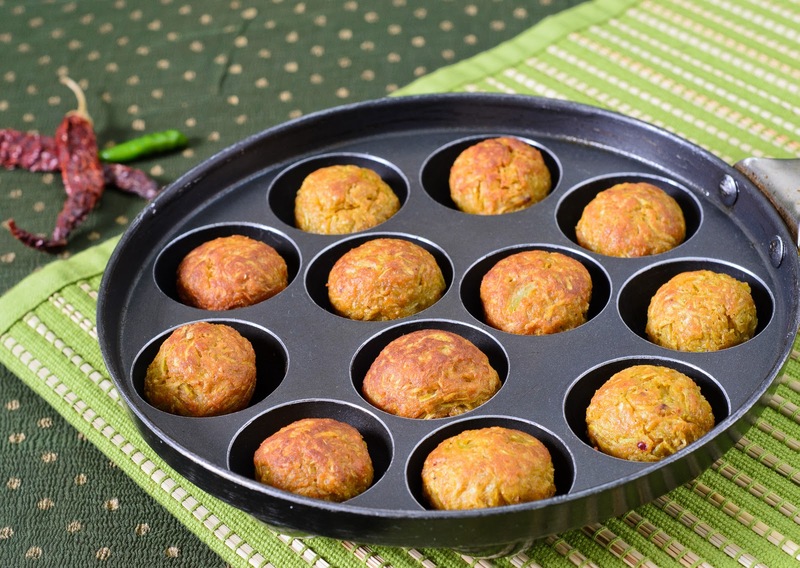 How would you compare, the traditional fried lauki koftas with this one? Esp if the insides are really cooked, the texture? I've seen several recipes on the internet, experimenting Kadhi-Pakora in the paniyaram pan- giving perfect shapes, touting the use of less oil. However, in order for the pakoras to be light, 'cooked through' and fluffy, it needs space and medium to expand. Would appreciate your thoughts and suggestions! thanks! @ Shri...Thanks for dropping by Shri..I totally agree with you, there is no comparison of fried koftas with these..fried koftas taste divine, their interiors are more softer and outer texture is crisp. I always used to deep fry the koftas but now I am trying to cut down on my fat consumption, that's why used this method. However I shaped the rounds smaller and did not press them hard, cooked on sim with lid closed, thus they were cooked from inside, but still on any day I would prefer the deep fried ones. Cheers! super yum ! bookmarked.. ! i have a lauki @ home, and have to try this out soon ! Super delicious kofta curry, inviting and super tempting. Also, the texture is different from the Kadhi Pakora. The Kadhi pakoras will be dense [ have tried it out] texture, particularly if less oil is is used in any paniyaram pan [ non-stick or otherwise]. The koftas look great and super yumm. All the best for your Vegan-diet. Wow Raji,this looks delicious.I had loads of lauki when i was on a diet sadly not anymore.just a quick question,can't I shallow fry it in a normal frying pan? Will it get cooked? @ Farwin..glad you dropped by... I too like to have lauki juice when I am on diet...it's very good. I have not tried shallow frying koftas in pan but I think you can do it..just keep the batter little loose and instead of round balls flatten them little with little wet hands. Also close with a lid when cooking and keep the gas on sim..hope it works and do tell me how it turned out when you make. The lauki balls looks crispy and they look naughty peeping out of the kuzhi pan (lol). nice presentation. best wishes for your vegan challenge, Raji. yummy n perfect kofta! !superb click raji! This looks fantastic. My mother-in-law has an ebelskiver pan so maybe I can convince her to let me borrow it make these! What a great #squashlove recipe. Lovely recipe, very interesting & looks tempting! Looks Mouthwatering koftas!! 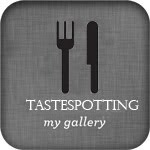 Nice to meet u. u have lovely space here if u like plz visit http://www.mycookingdiarys.blogspot.com Thanks to join me on fb. I'm falling in love with your blog:) It's so great that you are considering going vegan and you can still have your favourite dishes, there are so many ways to veganize vegetarian dishes. I'm going to share your blog with a large group of vegans, your recipes are toooo good:) If you need information about transitioning to veganism , feel free to contact me. But in my recipe I fry the koftas by dropping spoonfuls into hot oil in a kadai. It make the koftas very oily. I'll try it ur way next time. @Nupur..I am glad that this recipe turned out good for you...would love to see your post. Thanks for your kind words.